We are in need of a volunteer to produce a monthly electronic newsletter for us. If this is something that you'd be interested in, please sign up to volunteer and our Volunteer Coordinator will contact you with more information. Or you can contact our Volunteer Coordinator at 509-860-3368. 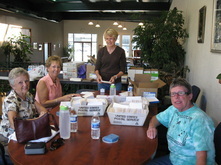 Thank you to our Newsletter volunteers!